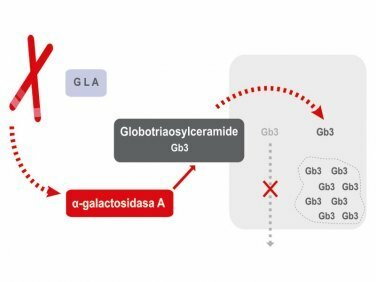 Fabry disease (or Anderson-Fabry disease) is due to the partial or total absence of the alpha-galactosidase A enzyme activity, which is in charge of degrading globotriaosylceramide (GL-3 or GB3). Since this fatty substance cannot be eliminated, it is accumulated and causes a malfunction of those sites in which it is deposited, affecting blood vessels, heart, kidney, liver, skin, and brain tissues. It is inherited following an X-linked pattern and therefore affects men more frequently than women (these can also be affected, although generally by a later and milder form). It is estimated that 1 in 50,000 males are affected, with a prevalence in the general population of 1 in 100,000 people. Since Fabry disease is uncommon and causes a wide range of symptoms, it can be confused with other diseases. Therefore, patients suffering from Fabry disease can go for long periods of time without a correct diagnosis. The main cardiac condition is left ventricular hypertrophy. Many of these patients are referred to doctors with a diagnosis of hypertrophic cardiomyopathy (actually, in 0.5%-1% of patients with hypertrophic cardiomyopathy, this is due to Fabry disease). Early diagnosis of Fabry disease is essential, since nowadays there are specific treatments available: intravenous administration of the deficitary enzyme. Subjects under suspicion or clinical diagnosis of Fabry disease. Children and adolescents: Acute or chronic limb pain unresponsive to the usual analgesics (acroparesthesias), recurring fever of unknown origin, intolerance to heat, cold or exercise, chronic intestinal disorders of uncertain origin, diffuse angiokeratomas, hipohydrosis, proteinuria, growth retardation, corneal opacities (“cornea verticillata”). Adults: Persistence of the above-mentioned symptoms, renal insufficiency of uncertain origin, left ventricular hypertrophy (hypertrophic cardiomyopathy), dyspnea, low tolerance to exercise, angina, thoracic pain, palpitations, arrhythmia, early cerebrovascular disease, loss of hearing and tinnitus. Familial study: Search for a mutation previously identified in a proband (families of patients with Fabry disease in which a mutation has been previously identified). Biegstraaten M, Arngrímsson R, Barbey F et al. Recommendations for initiation and cessation of enzyme replacement therapy in patients with Fabry disease: the European Fabry Working Group consensus document. Orphanet J Rare Dis. 2015 Mar 27;10:36. Laney DA, Bennett RL, Clarke V et al. Fox A, Hopkin RJ, Johnson J, O’Rourke E, Sims K, Walter G. Fabry disease practice guidelines: recommendations of the National Society of Genetic Counselors.J Genet Couns. 2013 Oct;22(5):555-64. Gal A, Beck M, Winchester B. Clinical utility gene card for: Fabry disease. Eur J Hum Genet. 2012 Feb;20(2). Disease-causing mutations are usually “point mutations”, approximately in 70% of cases, but small or large rearrangements have been described in up to 30% of cases.Using NGS (which allows for the detection of possible deletions), the probability of detecting a positive genetic study when the disease is well characterized clinically is close to 100%. This is the study of choice upon clinical suspicion of Fabry disease. It is performed through NGS, by the method of amplification of the GLA gene. It includes all exons and non-coding regions (UTRs, introns, and adjacent regions). It allows the evaluation of possible structural variants and copy-number variation (CNVs), which increases its diagnostic yield with respect to the traditional Sanger method technique. Priority Genes: These genes include >70% of the mutations that have been previously associated with the development of hypertrophic cardiomyopathy and/or their testing is recommended by the guidelines. Secondary genes: Other genes related to the disease. *Candidate genes: With no evidence, but likely to be related to the phenotype.